The Student Jail at Heidelberg University is proof that college students acting stupid is not a new thing. It is part of a long and rich history of university boys behaving badly. A stint in the Student Jail at Heidelberg University seemed to bring out the natural artist in its bad boy inmates. Every inch of wall and even the ceiling is covered with graffiti. As I write this, Spring Break has just ended, with the usual reports of naughty, outrageous and just plain stupid goings on by college students in their time off. Many adults shake their heads and wonder what the world is coming to. Where have these kids’ parents gone wrong? But this sort of behavior is far from new for young people away from home. And the “Studentenkarzer,” the Student Jail at Heidelberg University, is the proof. Starting in 1823 and continuing to the beginning of World War I in 1914, young scholars at the prestigious German university—the oldest in Germany and one of the oldest in Europe—who found themselves in trouble with the rules ended up in these attic rooms designed to keep them off the streets until they learned their lesson. And speaking of lessons, they were still expected to attend classes and lectures but had to return to their incarceration afterwards. There was a special door that allowed them to enter the Old University building directly from jail. 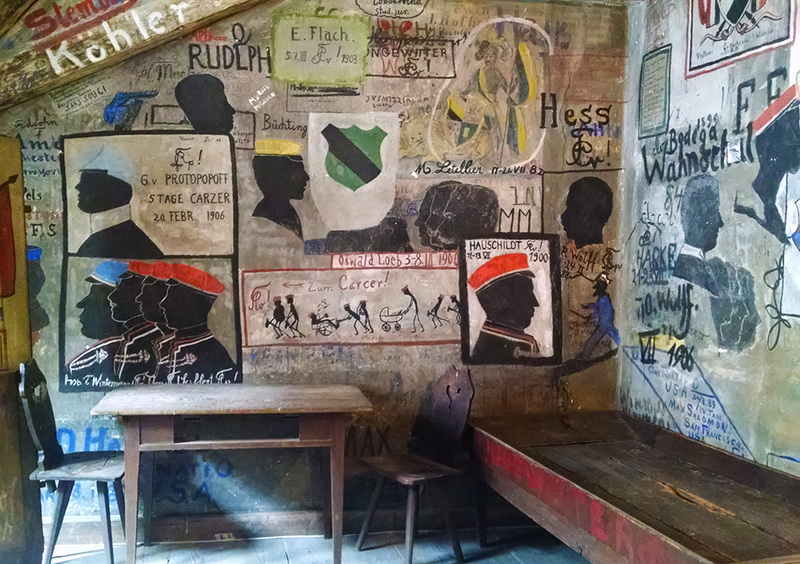 The walls of the Heidelberg University student jail were a blank canvas for the bored young men. Student inmates passed their time sleeping, studying…and decorating their prison. Young men have always liked to leave their mark! Go Directly To Student Jail. Do Not Pass Go. The most common infractions that could land a fellow in the college clink? Carousing and rabble-rousing, dueling, and freeing the pigs of the town farmers, apparently a hilariously popular past time. Then, as now, such antics were often fueled by alcohol. The penalties were most often a few days in the Studentenkarzer, though a few weeks or up to a month could be handed down for more serious offenses. 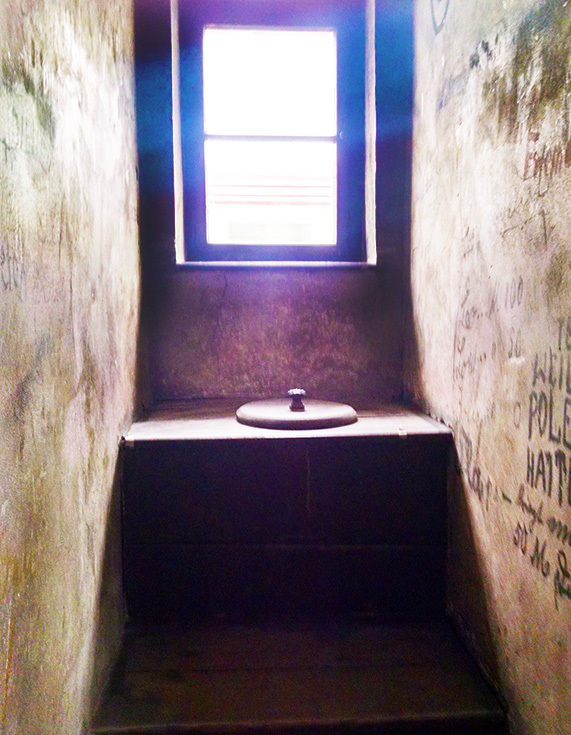 A “loo with a view,” tucked under the eaves of the student jail at Heidelberg University. The conditions weren’t bad, and apparently there was an almost universal party feel to the place. Students often broke the rules on purpose just to get a few days “inside” with their chums. 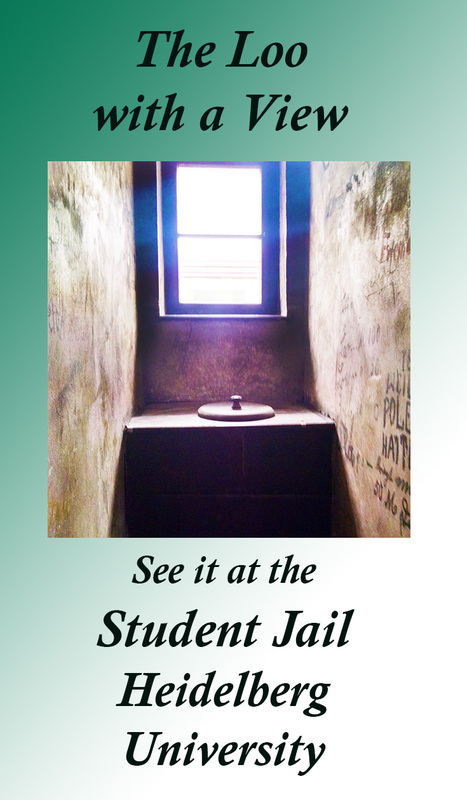 Seemingly, serving at least one stint in the student jail at Heidelberg University was something of a badge of honor. To see how these bad boys lived during their time in stir, you can visit the Studentenkarzer yourself. It’s located in the university quarter in the heart of Old Town, at Augustinergasse 2, behind the Old University building. 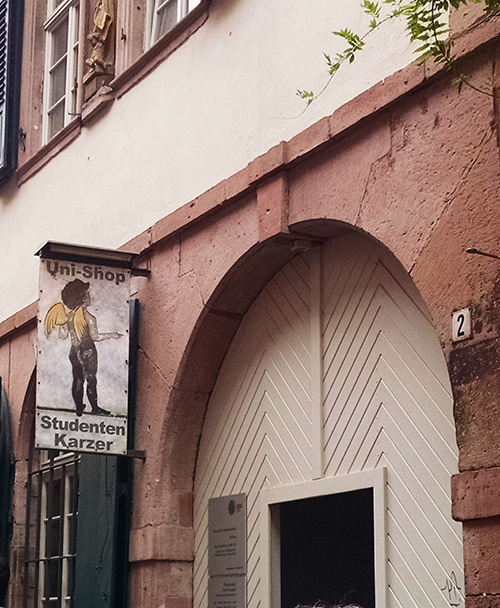 Look for the hanging sign with an incongruous image of a cherub and the words Uni Shop-Studenten Karzer. Past the entrance, climb a dark wooden stairway to the top floor jail. There are no cells here, just a warren of rooms high up under the eaves. Iron beds, wooden desks, a few chairs. But the rooms are far from dull or barren. That’s because spending time in the student jail seemed to bring out the inner graffiti artist in these collegiate inmates. 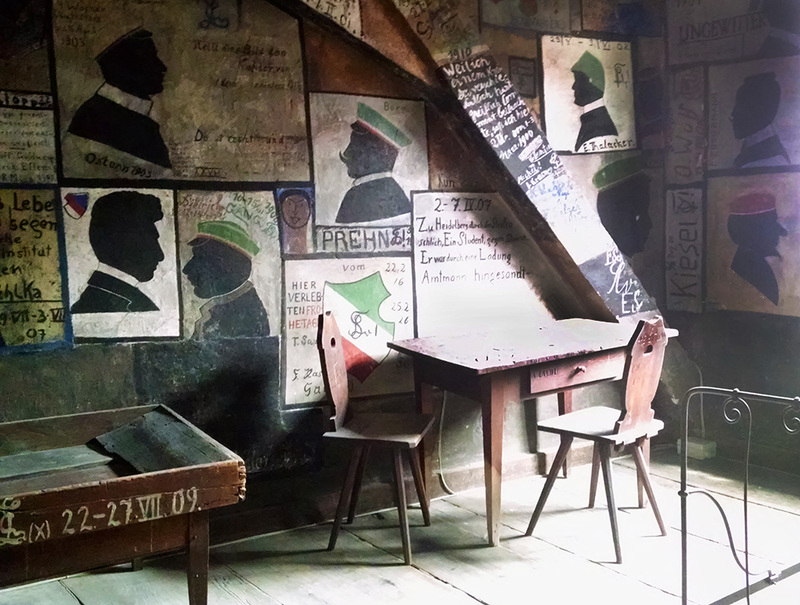 The walls are completely covered with graffiti—cartoonish drawings, fraternity badges, family crests, poems, names and clever epithets. Everywhere are silhouettes of the frat boys themselves, each topped with the colored cap that was a standard part of the university uniform in the 19th century. Family in the Student Jail at Heidelberg University??? While perusing the graffiti and snapping pictures, I came across one that especially made me smile. My grandfather, who I never knew, was born in Heidelberg. He left at 16 for America. I’m told he had a brother named Ernst who stayed behind. Could this have possibly been my great uncle, leaving his mark from a stint in the student jail at Heidelberg University? Probably not… but I can imagine it. 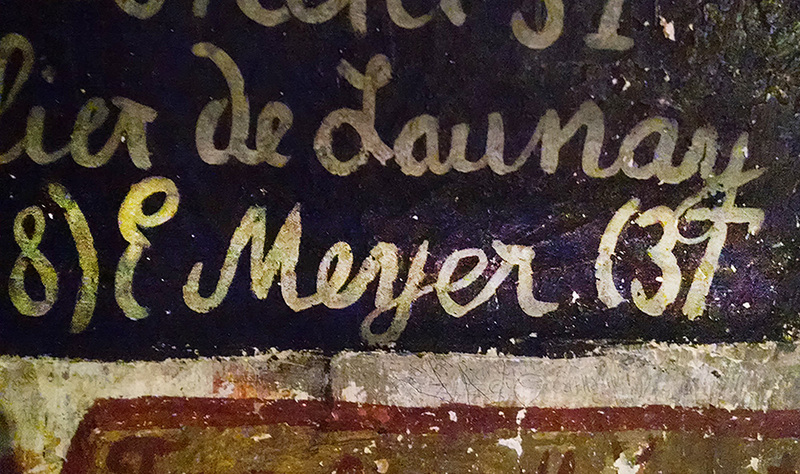 So think how delighted I was to find one bit of graffiti scrawled with the name E. Meyer. Yes, I know, I know. Meyer is as common as Smith in Germany. And Ernst as everyday as John. But I still enjoyed the fantasy that perhaps my great uncle had one night imbibed a bit too much and roused some rabble with the guys, maybe chasing a squealing pig along the river… and landed himself in the brig for it. The entrance to the Studenten Karzer at Heidelberg University, located at Augustinergasse 2. 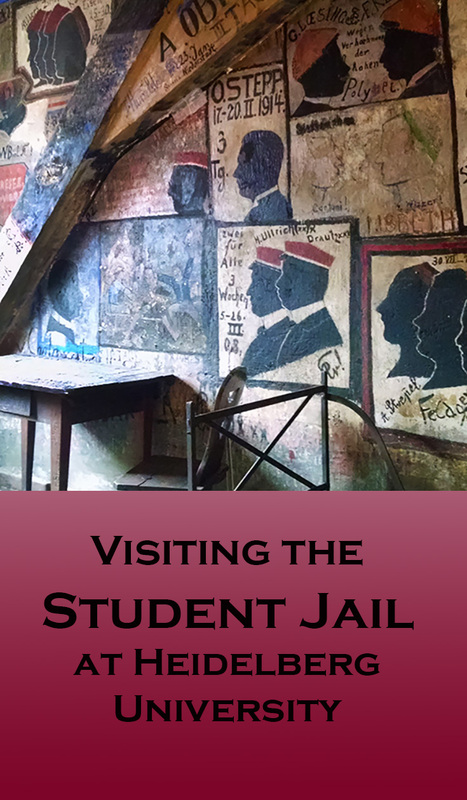 Entrance to the Student Jail at Heidelberg University is included in the Heidelberg Card. The Card is a great bargain at €15-19, depending on the number of days of validity. It also includes entrance to Heidelberg Castle, the funicular ride to get there, free public transit and lots of discounts. Without the Heidelberg Card, a ticket for the Student Jail at Heidelberg University costs €3, or €2 with a senior discount. This also includes admission to the Alte Universtat Museum, just around the corner, and the beautiful Alte Aule or Great Hall. You can get tickets at the university shop in the jail building’s ground floor. What a fun find. One of the jewels of travel, a glimpse of real life. Will surely see it next time I’m in Heidelberg. Agreed, Janet. I had no idea it existed before I saw it listed on the attractions on my Heidelberg Card. I’m so glad I did! Sounds like the have a system for “smart safe spaces”! Thanks for the great report! HaHa. Good way to think of it, Tom. Lol, what a fun story to read! Where do you dig up these unique places? Maybe a few of our male American students need to go to such a place. While it doesn’t actually sound that bad, it’s certainly not the cushy lifestyle many students are used to. Very fun post! Thanks, Patti. I actually learned about it on a walking tour through Old Town. I don’t think I ever would have noticed it on my own. It was a fun place to visit. Interesting and fun read! If I get to Heidelberg, will definitely check this out. Thanks! You’ll like it, Aysha. And you’ll like Heidelberg. It is a beautiful city. So interesting! I had no idea such existed. I didn’t either, Vicki. I found out about it on a walking tour and had to go back to learn more! It was a fun stop. What a crazy history. It’s good to know it’s not just my generation that was busy getting into trouble. HaHa, I agree, Kevin. I think Boys Behaving Badly likely has a very long history! Here in our country, especially when it comes to engineering students – our jail type would probably consist of architectural designs wherein you’d just stare at them for a certain period of time as a detention. It’s just really amazing. I couldn’t agree more! Thank you for this great read. Your description of that “punishment” made me laugh out loud! I’m glad you enjoyed the post. Thanks for the comment and the laugh.